When looking to choose between a window fan vs box fan it is somewhat important to understand how they work and in which scenario they work best. The fans actually work a little different. Window fans and box fans work to keep you cool in different ways. Box fans are used in close proximity to the person in order to get the direct breeze from the fan. The fresh breeze from the fan is what makes a person feel cooler. Window fans work a bit differently. Their purpose is to extract warm air from your room and push it outside, while concurrently bringing in cooler air from outside into your room. To understand those fundamental differences should make it easier to determine whether a window fan or box fan is the better choice for you. With that said, let’s run through the pros and cons of each. Window fans work by extracting warm air and/or bring in cool air to your room so are much more efficient at cooling a room than a box fan. Usually, the fans are reversible use these fans at any point of the day, you can pull cool air in, or push cool air out depending on the outside temperature and the temperature of your room. Window fans are very efficient at cooling the air in your house/room. The idea is that when it is cooler at night, you can use your window fan to bring in that cool air and use that cool air to keep your house cooler during the day. If you have rubbish, or there is a bad smell outside around your window, window fans can potentially woft that bad smell into your house or room (depending on which way your fan is blowing). Obviously, with the window open there is potential for bugs to inject themselves into your interior surroundings. You may potentially want to get a window fan screen in order to keep the pests at bay if you are in an environment with many pests! To add to this, things like pollen and dust can also be brought in via window fans. We hope you are not in an area where you need to worry about criminals jumping in your window, but it might be a consideration given a window fan will leave your window open. You probably know already, having the window open lends your room more open to noises from outside. With no window to dampen the noise, this could be an issue if you live in the loud outdoor. Box fans are smallish and very portable so can easily be moved around when you are moving from room to room. On average, box fans tend to have higher CFM. Given the fan has its airflow blow directly on or towards the person it creates a more instant cooling effect. It is not uncommon for box fans to be used in the window as a window fan to push air outside, or pull cool air in. It is not uncommon for a box fan to also double up as an air filter. Sounds crazy, but some people place water and ice packs in front of their box fan in order for the fan to blow cold air through the room. On the occasions that box fans are used in windows as window fans, they will not fit the space as well as window fans, leaving open space for bugs, dust, pollen etc to come in through the window and also affects the optimum cool/warm air ratio coming and going from the window. If you are looking for a strong breeze to direct onto yourself or the room, then there are more powerful options than box fans. 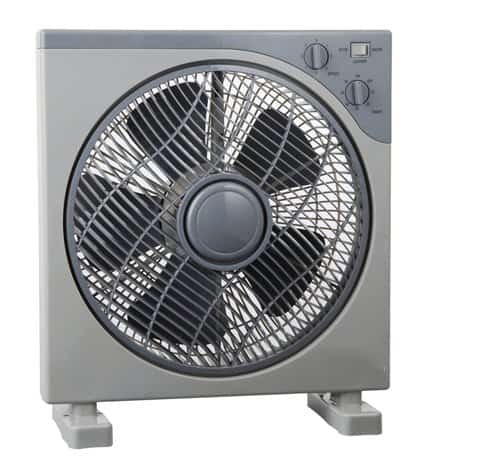 Tower fans, pedestal fans or floor fans are all much more powerful and provide much more breeze than box fans. As mentioned above, it is very common for box fans to be used as window fans. The best way is to use 2 (or more) box fans, one which brings the air in and one that pushes the air back outside effectively creating a draft through your room. You want to place the window fan pulling the air in from outside, on the coolest side of the house so you will be bringing in the cool air. The side of your house which is the warmest should have the air blowing out. Is It better to have a window fan blowing in or out? If you have only one fan then you will want to have your fan blowing in if it is cooler outside, so at nights to bring that cool fresh air in. If the air is warmer outside than in then you will want to blow the air out. This article gives you some useful placement tips as does the Dept. of Energy and Quora. Also, if you are looking for the best box fan, check out our in-depth buyers guide to finding the best box fan.